Celebrating its fifth year last month, BottleRock Napa Valley once again marked the unofficial launch of Northern California’s festival and arts season with a three-day, no-holds-barred music, food and wine festival held over the Memorial Day Weekend. This year included a roster of the world’s top musicians on four stages, including: Tom Petty & The Heartbreakers, Foo Fighters, Maroon 5, and Modest Mouse to name just a few. Delicate Productions who has provided full production services for the event since it’s inception, for the third time supplied a VUE Audiotechnik based complete house and monitor system on the Miner Family Winery stage. 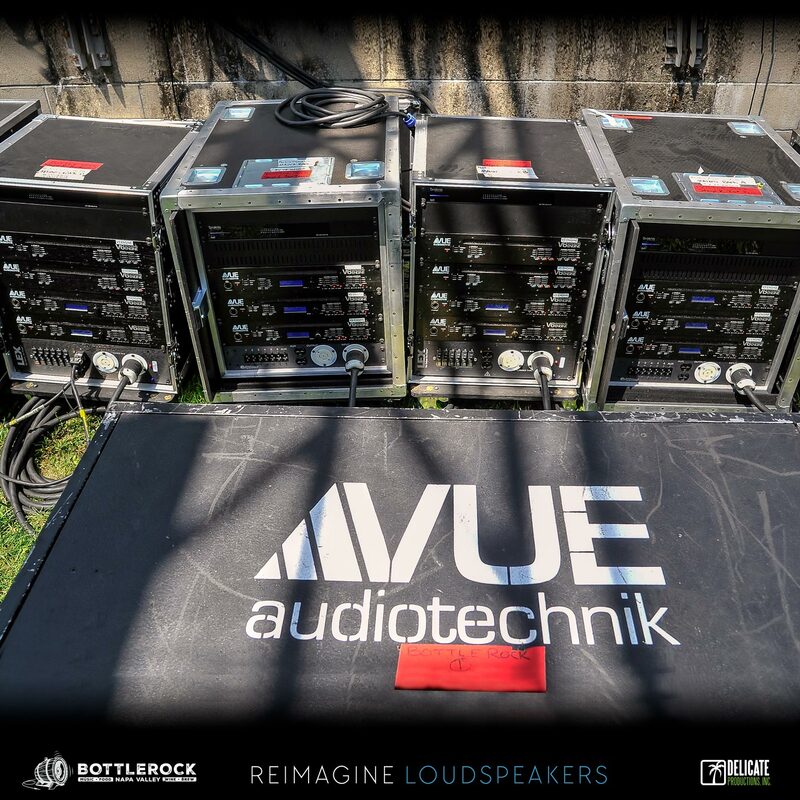 The all-VUE setup encompassed al-Class line arrays, h-Class monitors and subs, as well as a bevy of VUEDrive Systems Engines providing all the loudspeaker power and processing. Fifteen hs-221 dual 21-inch Infrasonic ACM subwoofers provided low frequency support for the FOH system, placed along the front of the stage. They were configured as five groups of three units in a cardioid directional configuration with two facing forward, and one backward to limit the amount of bass on stage. The entire subwoofer array used additional unit delay to form a virtual arc designed to maximize low frequency consistency throughout the audience areas. The stage monitor and front fill systems were provided by VUE h-Class loudspeakers, including hm-212 and hm-112 wedge stage monitors and hs-28’s with h-15 ‘s as side fills. Performers on the Miner Family Winery stage this year included: Doobie Decibel System, The California Honeydrops, Bob Moses, Allunageorge, Parade of Lights, Elephant Revival, Con Brio, Charles Bradley and Giraffage, Mavis Staples, Chris Shiflett, and Galactic. 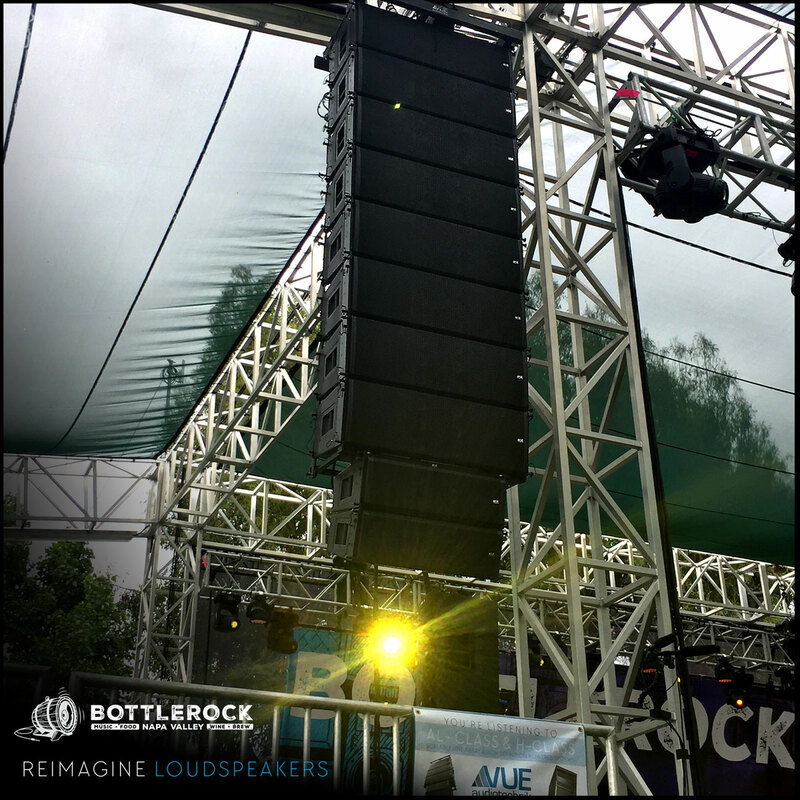 The al-12 continues to build a formidable reputation among mix and system engineers with may of the Bottlerock performer’s engineers praising the system and telling the VUE crew about previous positive experiences with VUE systems around the country. The main FOH system consisted of two hybrid CST arrays, each with eight large-format al-12 elements and two medium-format al-8 elements under hung for near field coverage. VUE’s unique and highly versatile Continual Source Topology (CST) eliminates the disruptions associated with conventional mixed element arrays. Thanks to CST technology, the Delicate team was able to easily achieve precise vertical coverage and absolute sonic consistency, while minimizing hang weight and sight line clutter. For low frequency support, Delicate deployed 15 VUE hs-221 dual 21-inch Infrasonic ACM subwoofers. The subs were positioned along the front of the stage in five groups of three units each. Each group was arranged in a cardioid directional configuration, with two facing forward and one backward to limit the amount of low frequency spillover on stage. Sophisticated DSP from the integrated VUEDrive electronics allowed the complete array to form a virtual arc, which maximized low-frequency consistency throughout the listening area. Rounding out the system were VUE hm-212 and hm-112 stage monitors, while a pair of h-15 two-way boxes atop hs-28 subwoofers delivered side fill. A VENUE Profile console served FOH duty, while a Yamaha PM5D handled monitors. Working from an Avid VENUE Profile console, Delicate’s Sebastian Poux served as house mixer for the stage. Monitors were in the capable hands of Lindsay Smith, who had a Yamaha PM5D console at her disposal.